WASHINGTON - World 110m hurdles record holder Liu Xiang of China lifted the title with a season best result at the New York Grand Prix of Reebok on Saturday. The 23-year-old finished in a time of 12.92 seconds to lead as the best result of the season 2007, which also broke the 13.03-second record in the event set by Allen Johnson in 2005. United States hurdlers Terrence Trammell, two-time Olympic runner-up, grabbed the silver in 12.95 seconds with Ryan Wilson third in 13.02 seconds. Dominique Arnold was disqualified for false start at the second whistle. 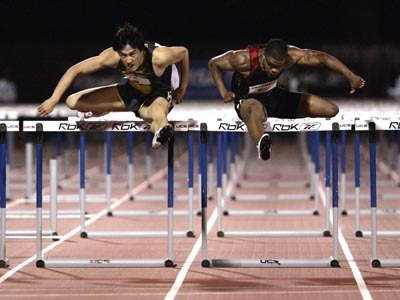 Liu came from behind to go head to head with Trammell until the eighth hurdle and capitalized his overwhelming capacity of sprint to touch the finishing line first with a slim of edge. Liu ran in New York in 2005 as the new Olympic champion, losing to veteran Allen Johnson. The next five athletes were David Payne, Aries Merrit, David Oliver, Anwar Moore and Maurice Wignall. The Shanghai star said his most important goal is winning in the Olympics next year but that he is more focused on Osaka at the moment. He won world championship bronze and silver medals in 2003 and 2005 and is determined to win the top prize this time. "I really want to see what winning the gold feels like this time," he said. "Osaka is my lucky track, and I hope it brings me success again." In 2004, Liu clocked a world record equalling 12.91 seconds to become Asia's first Olympic track men's gold medallist. He then broke the 13-year-old world mark by clocking 12.88 at the Super Grand Prix in Lausanne in July last year and he now holds three of the top 10 all-time performances. Liu has been a national hero since he won China's first ever men's Olympic track gold in Athens in 2004 and then smashed the world record last year.